At Chew Valley Generators we can supply load bank testing up to 1000kva to ensure your generator is at its peak performance. These are supplied with cable sets and mounted on road trailers. Our Load banks can be hired for use by one of your engineers or we can supply an engineer to carry out the test for you. 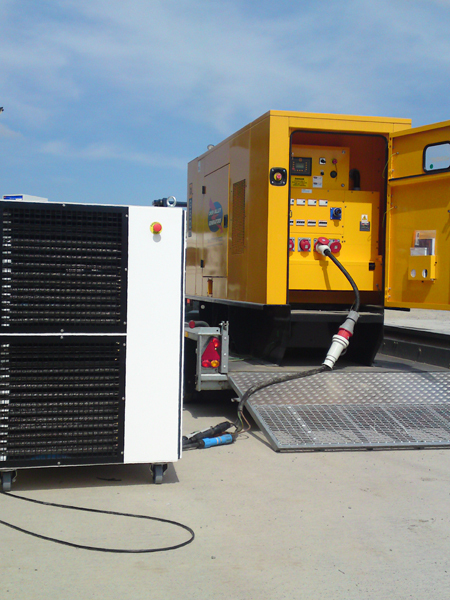 Our load banks can be brought to site, allowing the generator to be load tested safely in controlled conditions, at a time that suits your business. Each load test is designed for that particular generator. We test the generator over a range of loads, monitoring and data gathering constantly for 2 to 4 hours. We eventually test the overload capacity of the generator, giving the machine a thorough workout in the process. Regular load bank testing of generators provides an essential health check service to prevent diesel engine failure due to wet stacking. Wet stacking occurs due to under loading of the generator which results in wet un-burned fuel building up in the engine. This fuel build up will over time line the combustion chamber cylinders and cause a reduction of the engines rating and efficiency which will ultimately cause premature failure of the generator. Running the generator on load of 50% – 100% of the generators rating will allow the engine to reach the recommended operating temperature, which will burn off the choke deposits. Load banking is a very important part of keeping your generator running – without this service you could be damaging your generator. Our load banks are Variable load with 1kW resolution, totally enclosed and fan-cooled. Standard control systems include simple manual control by selector switches, with local or remote manual control terminals used for straightforward load testing. A load bank is a device which develops an electrical load, applies the load to an electrical power source and converts or dissipates the resultant power output of the source. The purpose of a load bank is to accurately mimic the operational or “real” load that a power source will see in actual application. However, unlike the “real” load, which is likely to be dispersed, unpredictable and random in value, a load bank provides a contained, organized and fully controllable load. Consequently, a load bank can be further defined as a self-contained, unitized, systematic device that includes load elements with control and accessory devices required for operation. Whereas the “real” load is served by the power source and uses the energy output of the source for some productive purpose, the load bank serves the power source, using its energy output to test, support or protect the power source. For more information on the hire of a load bank please contact us on 01761 221 000 orinfo@chewvalleygenerators.co.uk.